We really enjoyed the cruise. Normally we prefer the larger “fun” ships with NCL such as the Epic, Getaway and Escape but with five ports of call and only one day at sea it really didn’t matter not having the waterslides and other activities found only on these ships. Some (negative) general comments first. Although we still enjoy cruising with NCL, we have noticed increasing costs and certain cuts since we first started with them 6 years ago. Perhaps they are just following a trend in the industry but the changes have been noticeable. Some examples: - Adding a room service fee, first for overnight orders and now at all times. - Not allowing people to bring food to their room (thankfully that ended very quickly when it was announced!) - Not allowing people to bring non-alcoholic beverages on board. - Charging extra for certain dishes in the main dining rooms (looks like this was stopped) - Sharp increases in the cost of their drinks as compared to bars/restaurants on land. A couple of years ago they had these “premium” drinks such as a Dark and Stormy for $18 as compared to $12 for other drinks. These prices were not on the menu on this cruise. - Less interesting options at the buffet during theme nights. They had crab legs in the main buffet on our first cruise on the Epic. - Charging $2 more for the same volume of Heineken in a draft at O’Sheehan’s than what you get in the bottle. Both the glasses they use as well as the bottles are 12 oz. You can buy both! Maybe it is just me but I would have assumed a pint class would be used at a pub. I think it is important for passengers to provide their feedback, both positive and negative, directly to NCL for these and any other items you want to bring up. I normally do after each cruise! Now moving on! 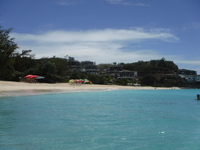 Itinerary - We started with one day at sea, followed by stops in Barbados, Antigua, St. Kitts, St. Maarten and St. Thomas. - We would have preferred having the sea day on our last day of cruising. Would have been a great way to relax after getting off the ship five days in a row. However, I think this would require reversing the order of the stops as Barbados is the furthest destination. The ship - As I mentioned earlier, the ship is smaller and doesn’t have the water slides, rope courses, climbing wall, large sports deck (though it does have a smaller one), etc that you will find on some of their bigger ships . - Some of the areas (such as the theater and main restaurants) were really cold, more so than I would normally expect on a cruise ship. It was mentioned by a number of other travellers we spoke with too. I would suggest bringing a shawl, light jacket, long sleeve shirts, etc. The theatre was probably the worst. Getting on and off the ship - Embarkation went smoothly. We boarded between 1:00 and 1:30, with our cabin being available within an hour or so. - Our cabin was on deck 5 which made if very convenient to get on and off the ship from deck 4 at each port of call. - Disembarkation was really easy and stress free. We used the self assist option so we were able to keep our bags with us overnight as opposed to leaving them out by 11 pm the night before. One major difference here with self assist is that we didn’t need to rush off the boat early as we have experienced on the Epic, Getaway and Escape when using this option. Transfers between the airport and the Pan American Pier - We spent the night in Isla Verde before the cruise and used an UberXL to get there for around $14. In general, Uber is an inexpensive and convenient way to travel around San Juan. - On the day you disembark, you have multiple options for the airport when you exit the terminal. - NCL’s is probably the most expensive of them all and I would not recommend it. - When you first leave the terminal, there will be a series of private shuttles charging $10 per person. They will also wait until they feel they have enough passengers. I would also suggest that you skip this option. - If you walk a little further, maybe 40 feet, you will find the regular taxi line. Fares are regulated and costs $21 plus $1 per piece of luggage to the airport. You will first speak to a dispatcher who will provide you with a paper confirming the cost. On our day, there was an exception where they were adding an extra $3.50 because the usual route to the airport was closed due to construction. - It does appear that Uber is an option but the fares at the time were similar and involved a bit of wait before a car could arrive. Cabin - We were on deck 5 with a window. Note, on deck 4 the windows are portholes. - We were three, 2 adults and a child. There is a bunk bed that folds out from the wall. I don’t see how a second child could be accommodated in this cabin as there is no convertible sofa or anything and little to no room for an extra cot. - There are plenty of drawers (6) as well as some shelves in the closet. However, we still found it useful having brought magnetic hooks as well as some extra hangers. Food - We find the food at the complimentary restaurants to be more than sufficient for us so we don’t typically eat at any of the speciality options. - Of the two main dining rooms, we preferred Aqua over the Venetian. This has nothing to do with the food since they have the same menu but rather we found the service to be faster. Not sure if this has anything to do with the fact it is smaller. - The food at O’Sheehan’s was excellent. - The food is also excellent at Bamboo but reservations are required if not at least recommended. - We had supper one night at the buffet. It was ok but it is not as good as we experienced six years ago when we first started cruising on NCL. The theme nights and associated options just seemed better back then to be honest. - There is room service but NCL charges a convenience fee of close to $8 per order. When we first started cruising with them, there was no fee. Then they added one for overnight orders which looks like they have extended to all hours. Bars – pay attention to the glass size used for drafts at O’Sheehan’s - Didn’t really hang out at any of the bars on this trip but we did have supper one night at O’Sheehan’s, where the food is very good and is complimentary. - They only had two beers on tap, one of them Heineken. I would have expected more at a pub to be honest. - Note, they are serving their draft beer in 12 oz glasses, not 16 oz (pints) that you would normally be accustomed to at a pub. You can also order Heineken in 12 oz bottles. - For some reason, the same size in a draft costs $2 more than the bottle. The reasoning provided was that the quality is better with the draft something that I don’t agree with when it comes to beers like Heineken. I wished I had noticed the size before ordering the draft. Activities - The fitness centre is more spacious on the Dawn as compared to the bigger ships. You don’t have that cramped feeling. - The jogging track is on deck 13 and also has less traffic than what I am accustomed to on the Getaway and Escape. - On deck 7, you can walk, not run, along the promenade all the way around the ship. - For the first time we played shuffleboard. Our child was really into it and became his new ping pong obsession/replacement while onboard. There are two on deck 7 and one on deck 13. - Speaking of ping pong, there are two tables on deck 13 near the sports deck. However, they are in a spot that receives a lot of wind when the ship is moving so it really affects the ball. Pool, hot tubs and chairs - There is one pool and four hot tubs on deck 12. There is an additional hot tub at the front of the ship on deck 13. - The kids’ area at the back of the ship has another hot tub as well. - We didn’t have any problems finding chairs either in the sun or in the shade during our one sea day. Entertainment - The production shows are not at the same level as the ones we’ve experienced on the Epic, Getaway and Escape. If you are expecting something similar then you will be disappointed. - The comedian on the other hand was fantastic. He had two nights of shows in the main theatre, one family friendly and one 18+ and both were great. There is no separate comedy club having nightly shows. Splash Academy – Kids club - There weren’t as many children on this cruise and consequently not many using Splash Academy, including ours. - The staff members were really friendly and trying to get children involved but I can see how with few other kids around at the kids club, your child may not want to spend much time there. - Luckily, ours was meeting people on the sports deck and playing with them after getting back on board at the end of the day. We really enjoyed the cruise. Normally we prefer the larger “fun” ships with NCL such as the Epic, Getaway and Escape but with five ports of call and only one day at sea it really didn’t matter not having the waterslides and other activities found only on these ships. - Adding a room service fee, first for overnight orders and now at all times. - Not allowing people to bring non-alcoholic beverages on board. - Sharp increases in the cost of their drinks as compared to bars/restaurants on land. A couple of years ago they had these “premium” drinks such as a Dark and Stormy for $18 as compared to $12 for other drinks. These prices were not on the menu on this cruise. - Less interesting options at the buffet during theme nights. They had crab legs in the main buffet on our first cruise on the Epic. - Charging $2 more for the same volume of Heineken in a draft at O’Sheehan’s than what you get in the bottle. Both the glasses they use as well as the bottles are 12 oz. You can buy both! Maybe it is just me but I would have assumed a pint class would be used at a pub. I think it is important for passengers to provide their feedback, both positive and negative, directly to NCL for these and any other items you want to bring up. I normally do after each cruise! 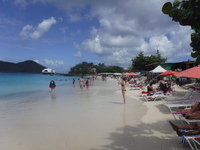 - We started with one day at sea, followed by stops in Barbados, Antigua, St. Kitts, St. Maarten and St. Thomas. - We would have preferred having the sea day on our last day of cruising. Would have been a great way to relax after getting off the ship five days in a row. However, I think this would require reversing the order of the stops as Barbados is the furthest destination. - As I mentioned earlier, the ship is smaller and doesn’t have the water slides, rope courses, climbing wall, large sports deck (though it does have a smaller one), etc that you will find on some of their bigger ships . - Some of the areas (such as the theater and main restaurants) were really cold, more so than I would normally expect on a cruise ship. It was mentioned by a number of other travellers we spoke with too. I would suggest bringing a shawl, light jacket, long sleeve shirts, etc. The theatre was probably the worst. - Embarkation went smoothly. We boarded between 1:00 and 1:30, with our cabin being available within an hour or so. - Our cabin was on deck 5 which made if very convenient to get on and off the ship from deck 4 at each port of call. 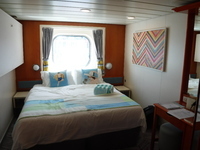 - Disembarkation was really easy and stress free. We used the self assist option so we were able to keep our bags with us overnight as opposed to leaving them out by 11 pm the night before. One major difference here with self assist is that we didn’t need to rush off the boat early as we have experienced on the Epic, Getaway and Escape when using this option. - We spent the night in Isla Verde before the cruise and used an UberXL to get there for around $14. In general, Uber is an inexpensive and convenient way to travel around San Juan. - On the day you disembark, you have multiple options for the airport when you exit the terminal. - NCL’s is probably the most expensive of them all and I would not recommend it. - When you first leave the terminal, there will be a series of private shuttles charging $10 per person. They will also wait until they feel they have enough passengers. I would also suggest that you skip this option. - If you walk a little further, maybe 40 feet, you will find the regular taxi line. Fares are regulated and costs $21 plus $1 per piece of luggage to the airport. You will first speak to a dispatcher who will provide you with a paper confirming the cost. On our day, there was an exception where they were adding an extra $3.50 because the usual route to the airport was closed due to construction. - It does appear that Uber is an option but the fares at the time were similar and involved a bit of wait before a car could arrive. - We were on deck 5 with a window. Note, on deck 4 the windows are portholes. - We were three, 2 adults and a child. There is a bunk bed that folds out from the wall. I don’t see how a second child could be accommodated in this cabin as there is no convertible sofa or anything and little to no room for an extra cot. - There are plenty of drawers (6) as well as some shelves in the closet. However, we still found it useful having brought magnetic hooks as well as some extra hangers. - We find the food at the complimentary restaurants to be more than sufficient for us so we don’t typically eat at any of the speciality options. - Of the two main dining rooms, we preferred Aqua over the Venetian. This has nothing to do with the food since they have the same menu but rather we found the service to be faster. Not sure if this has anything to do with the fact it is smaller. - The food at O’Sheehan’s was excellent. - The food is also excellent at Bamboo but reservations are required if not at least recommended. - We had supper one night at the buffet. It was ok but it is not as good as we experienced six years ago when we first started cruising on NCL. The theme nights and associated options just seemed better back then to be honest. - There is room service but NCL charges a convenience fee of close to $8 per order. When we first started cruising with them, there was no fee. Then they added one for overnight orders which looks like they have extended to all hours. - Didn’t really hang out at any of the bars on this trip but we did have supper one night at O’Sheehan’s, where the food is very good and is complimentary. - They only had two beers on tap, one of them Heineken. I would have expected more at a pub to be honest. - Note, they are serving their draft beer in 12 oz glasses, not 16 oz (pints) that you would normally be accustomed to at a pub. You can also order Heineken in 12 oz bottles. - For some reason, the same size in a draft costs $2 more than the bottle. The reasoning provided was that the quality is better with the draft something that I don’t agree with when it comes to beers like Heineken. I wished I had noticed the size before ordering the draft. - The fitness centre is more spacious on the Dawn as compared to the bigger ships. You don’t have that cramped feeling. - The jogging track is on deck 13 and also has less traffic than what I am accustomed to on the Getaway and Escape. - On deck 7, you can walk, not run, along the promenade all the way around the ship. - For the first time we played shuffleboard. Our child was really into it and became his new ping pong obsession/replacement while onboard. There are two on deck 7 and one on deck 13. - Speaking of ping pong, there are two tables on deck 13 near the sports deck. However, they are in a spot that receives a lot of wind when the ship is moving so it really affects the ball. - There is one pool and four hot tubs on deck 12. There is an additional hot tub at the front of the ship on deck 13. - The kids’ area at the back of the ship has another hot tub as well. - We didn’t have any problems finding chairs either in the sun or in the shade during our one sea day. - The production shows are not at the same level as the ones we’ve experienced on the Epic, Getaway and Escape. If you are expecting something similar then you will be disappointed. - The comedian on the other hand was fantastic. He had two nights of shows in the main theatre, one family friendly and one 18+ and both were great. There is no separate comedy club having nightly shows. - There weren’t as many children on this cruise and consequently not many using Splash Academy, including ours. - The staff members were really friendly and trying to get children involved but I can see how with few other kids around at the kids club, your child may not want to spend much time there. - Luckily, ours was meeting people on the sports deck and playing with them after getting back on board at the end of the day. We spent the day at Ffryes Beach. Took around 20 minutes by shared taxi and we had to arrange our return time with the driver. It’s a crescent shaped beach, with turquoise colored water and a restaurant at each end. On the north end, you will find Dennis Cocktail Bar and Restaurant while on the south end you have the Tiki Bar. The former is an open air restaurant with bathrooms and a varied menu where as the latter is more of a largish beach shack with a limited menu. We ended up eating at the Tiki Bar. For $10 we got a plate with salad, pineapple, stir fried noodles, rice and beans and BBQ chicken. It was really good and the portion was large. They were very friendly and the place had a great vibe to it. For chair and umbrella rentals, you actually have a few options and don’t need to go with one of the restaurants. We rented 3 chairs for $5 each and placed ourselves under a tree. Just a first quick note. Everyone we met during our port of call was really friendly. Even the vendors on the beach weren’t pushy or anything. It was so nice to see. We’d consider coming back to the island for a week’s stay from what we experienced that day! 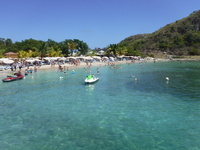 We spent the day at the Harbour Lights beach club in Carlisle Bay. It took us around 10 to 15 minutes in a shared taxi to get there. I think we paid $5 pp each way. You can decide ahead of time whether you want to arrange a pickup time with your driver but it is not necessary as you can get on other taxis to head back. You also aren’t obligated to stay here. You can walk along the beach and check out some of the other places as well before making your choice. I did a quick walk around and in the end decided to stay here. There are a number of other places, some similar as Harbour Lights and some really small. In general the prices are pretty much the same for the bigger places. They have bathrooms, showers, wifi, etc. Chairs are $10 each and every 2 chairs there is an umbrella so you will get shade even if you only take an odd number which is nice. 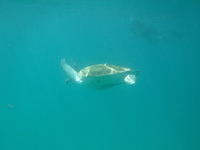 They also have the option for $20 that includes a snorkelling tour and the chance to swim with a turtle. We stuck with the chair/umbrella only option. However, bring your snorkeling equipment if you want to swim with a turtle anyways. The boats actually do this not too far from the shore, maybe 50 to 75 meters away. You can actually see where they all head to. I was amazed at how big the turtle was, maybe the size of a 10 year old child! We spent the day at Cockleshell Beach on the southern end of the island. Took around 20 to 30 minutes in a shared taxi we had to arrange our return with the driver. This seems to be a theme at most of the ports of call we’ve been to. At one point you come to the top of a hill where you can look down to the narrow stretch of land with the Atlantic on one side and the Caribbean on the other. It is quite scenic. 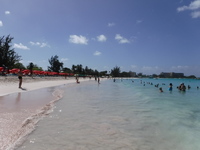 There are a number of places on the beach from which you can rent chairs and umbrellas and order food and drinks. Prior to our cruise, I had shortlisted the following three places; The Lion Beach Bar and Grill, The Reggae Beach Bar and Grill and Mundo Water Sports. The first two are more developed and have bathrooms with plumbing and are located at opposite ends of the beach. The last one is more of a large shack near Reggae. We went to the Sunset Bar and Grill to watch the planes landing at Maho Beach. Spent around 90 minutes there and took around 30 minutes to get there. The beach is really small so the only real reason to go there is to watch the planes. If you take a taxi from the port, it will cost you $16 return per person. Instead, we left from Philipsburg and took a bus for $2 per person each way. We got on Walter A. Nisbeth Road near Tamarinde Steeg. Just ask a local or even better someone at a souvenir store like we did. Or if you want to take it from near the port, I’m sure that tourist information could tell you. One thing, most if not all of the “busses” are really vans that show their destination. Our driver also told us that we could take a bus back to the port from Maho for $5. For the rest of our day, we walked around the shops in Philipsburg before heading back to the ship. It takes around 15 minutes to walk. You also have the option of taking the water taxi for $7 return or $5 one way. There are a number of electronic stores but I suggest you do your research beforehand and/or have access to the internet so you can compare prices. I was interested in getting an unlocked phone but the prices were pretty much the same as to what I can order back home on Amazon. Then again, maybe I’m just not good at haggling:) In all honesty, I don’t even like to haggle. We got pretty lucky in St Thomas. Normally this is a busy port of call which we thought would be made worst with the fact that we were coming in on a Saturday. Surprisingly, we were the only cruise ship in port that day! 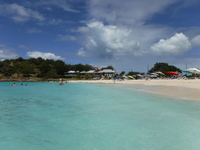 We headed to our favourite beach when we cruise the Caribbean, Coki Point. It is not very big but has beautiful blue water and a very local feel to it. Chairs go for $5 each. You can also rent umbrellas but we always head down to a spot shaded by a large tree. It’s a bit quieter further down you go from where you are dropped off. One nice thing here is that you do not need to arrange for your pickup time. There will always be a taxi there for you or you can ask for one to be called. Now you can rent chairs and umbrellas and order food and drinks all along the beach. The only thing that I haven’t figured out is who you are actually renting and buying from. For example, we rented our chairs close to the furthest point away from where you are dropped off. However, the waitress who took care of us (Wendy who was really great!) came from further up the beach even though there was a place right next to us. It seems like the waiters/waitresses can service any part of the beach and they all respect each other’s customers. The place we ordered from only accepted cash but the place next to us did advertise that they accepted credit cards. I suggest you ask ahead if you want to find a place that will. You can snorkel here. Usually the best spot is closer to Coral World. Bring dog biscuits as the fish love that. There was also what looked like a baby shark. I’ll be honest though, there did seem to be less fish this year than in the past. The water was choppier than what we’ve had before so maybe that played a part. Also, you normally see a lot of lizards on the rock face but this year we didn’t see any.